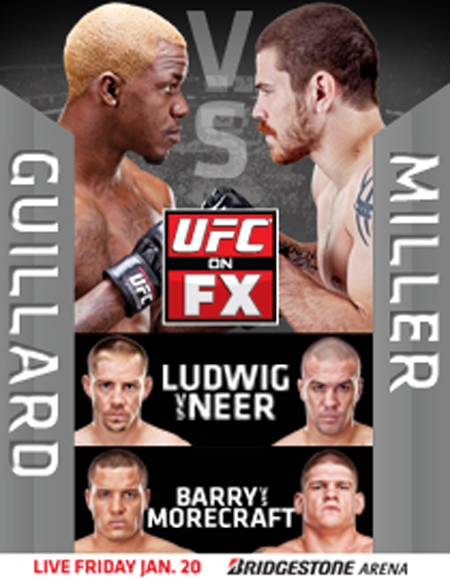 “UFC on FX: Guillard vs. Miller” took place Friday inside Bridgestone Arena in Nashville, Tennessee. A shootout between Melvin Guillard and Jim Miller headlined the freebie fight card. Duane Ludwig, the owner of the fastest knockout in UFC history, metets Josh Neer in the co-main event. 1stRound: They both come out firing. Denis gets Sandoval in a Thai clinch and unloads several short elbows to his dome. Sandoval is knocked out cold as he drops to the canvas. That was fast. 1stRound: Pineda tags him with some bombs and takes Schilling to the mat. He immediately advances to full-mount, now takes his back. Pineda is bringing the pain. He locks in a rear-naked choke, as Schilling gets to his feet to try and get loose. Schilling is forced to cry uncle. 1stRound: Hayden tags him with a nice uppercut and tries to follow up with a takedown. Camoes attempted a kimura for a brief moment. Hayden eats a knee, but plants Camoes on the canvas for his efforts. He let him back up. Camoes gets taken down and tries an omoplata. The submission specialist now takes his back and locks in a rear-naked choke. It’s a wrap. 1stRound: Brenneman eats a left hand, but secures a double-leg takedown. He easily advances to side-mount and gets Roberts in a crucifix position. After taking a barrage of shots to the dome, Roberts moves him back to his guard. Brenneman, 10-9. 2ndRound: Roberts unloads a head kick. Brenneman goes for another takedown and almost gets caught in a guillotine choke on the way down. Just like in the opening stanza, Brenneman moves to a crucifix position and is laying the lumber. The fighters get stood up. Brenneman instantly goes for a single-leg, but Roberts is trying a kimura, now an armbar and back to a kimura. Roberts now attempts an inverted triangle choke as the horns blares. Brenneman, 10-9. 3rdRound: Brenneman has him staring at the arena lights within seconds. He moves to side-control. They get stood up again. Shocker, Brenneman takes him down again. Roberts tires to rally with a kimura from the bottom. Too little, too late as the bell sounds. Brenneman, 10-9 and sweeps him, 30-27. 1stRound: For simplicity, I will refer to them as Kamal and Khabib. Kamal is walking him down. Kamal is throwing bombs, but nothing has landed. Khabib floors him with a big left hook and is going for the kill. He moves to side-mount with a minute left. Kamal gets to his feet and comes out swinging. Khabib, 10-9. 2ndRound: Khabib works hard for a single-leg and finally gets it. They get stood up. Khabib scores another takedown. The lightweights get stood up again and Khabib tags him a couple of times as the round ends. Khabib, 10-9. 3rdRound: They are slinging leather to start the round. Khabib gets a takedown and Kamal tries for a guillotine on the way down. Khabib advances to full-mount and secures a rear-naked choke. Game over. 1stRound: FYI – Rivera is retiring after this fight. Schafer puts him down in less than a minute into the middleweight affair. Rivera gets back to his feet for a brief moment before getting sent back to the mat. Schafer, 10-9. 2ndRound: Schafer grabs a single-leg and holds on for too long. Rivera starts dropping bombs on hid head. After several powerful shots, the fight is called. Congrats on the win and your career, Jorge. 1stRound: Morecraft catches a kick and trips him to the mat. He moves to full-mount, but Barry gets back to his feet. Barry scores on three big jabs. Morecraft lands another takedown. He gets Barry in an armbar, though Barry barely escapes. That was close. Barry clocks and drops him with a violent left hook. He pounces and unleashes bombs to clean up the job. Game. Set. Match, Barry. 1stRound: Both bantamweights exchanging a barrage of shots while in the clinch. Easton has him pressed against the cage, Papazian reverses. Papazian eats a right hook. Close, back-and-forth round to score. Easton, 10-9. 2ndRound: Papazian tags him with a left. Eason counters with a left of his own. Easton continues to hunt him down. Easton lands a violent leg kick and right hand to follow. Papazian has him pressed against the fence. Papazian scores with a right. Easton plants him on his back. Easton, 10-9. 3rdRound: They are throwing blows to start the final segment. Papazian has him clinched against the cage. Easton clocks him with a right hand. They are in standing in the pocket and trading. Papazian hits him with an uppercut. Easton, 10-9 and wins the fight, 30-27. 1stRound: Ludwig rocked him with a right early. Ludwig nails him with a big knee to the body. He follows up with two more. Neer is eating a ton of powerful shots, but marches forward unfazed. Neer catches a kick and trips him to the ground. Neer locks in a guillotine choke. Ludwig can’t tap because he’s already sleeping. 1stRound: Guillard floors Miller with a left hook. Miller is still pressing forward, but he still appears tipsy. Miller eats a knee to the face. Miller seems to have recovered. Guillard lands another flying knee but gets planted on his back for his efforts. Guillard tries to scramble and Miller takes his back. He locks in a rear-naked choke, and guess what, Guillard loses again via submission. Nine of “The Young Assassin’s” 10 defeats have now come by way of tapout.